“Cocky” Is Taken, What’s Next? It’s ironic that author Faleena Hopkins chose to trademark this particular word. Not “nice” or “humble”, for instance, but “cocky”. She must have had her reasons. However, did she think it through? The very fact that one can register a trademark for a word is incomprehensible, but here we are: if you write in the field of romance, you better choose your words carefully now. No matter what else might happen with #Cockygate one thing is clear: it pays off to be humble and nice. And if you’re “boldly or brashly self-confident” — you’ll reap trouble. Enjoyed the post? Share it, like it — Thank you. Image: Pierre-Auguste Renoir. Landscape with Woman Gardening (Paysage et femme jardinant), c. 1896. Oil on canvas (later mounted to fiberboard), Overall: 18 1/8 x 21 5/8 in. (46 x 55 cm). BF884. Public Domain. Do you use first person in your writing? Do you opt for third person because of the notion that it makes your writing “more objective”? Are you fond of reading/writing lyric poetry “grounded in everyday experience”? Share in the comments. And if you’ve enjoyed the post, press “like” and “share” buttons — thank you. Image: Pierre-Auguste Renoir. 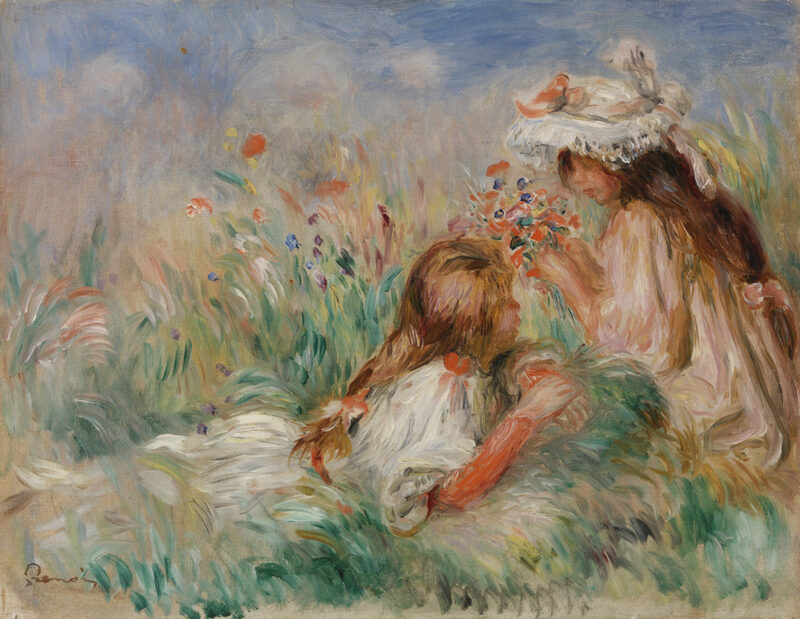 Girls in the Grass Arranging a Bouquet (Fillette couchée sur l’herbe et jeune fille arrangeant un bouquet), c. 1890. Oil on canvas, Overall: 12 13/16 x 16 9/16 in. (32.5 x 42 cm). BF155. Public Domain. Got any plans for April? 2018 April Poem-A-Day (PAD) Challenge will be here before you know it. “I believe in diversity as far as the form and content of poems–expressing a wide range of opinions. As long as it is done respectfully. Now, if you’re new to the challenge, Poetic Asides is not a political forum — it’s a poetry blog. However, it’s very refreshing to see its commitment to remain a place of free expression. We should not be afraid to voice our opinions. Write poetry, be respectful while exercising free speech, don’t be a troll — that’s what PA is about. So, flex your poetry muscles! Have you participated in PAD challenges? Are you in for the poem-a-day this April? Share in the comments. If you’ve enjoyed the post, press “like” and “share” buttons — thank you. The Voice of Silence vs. Performance Art, or Is Poetry Meant to Be Read Out Loud? Here’s more on Poets as Performers and the art of performing a poem. What say you? Do you enjoy hearing poetry read out loud, or do you prefer hearing it in your own head? Do you think SLAM poetry “stands up on the page”? Do you attend poetry readings? If you’ve enjoyed the post, press the “like” and “share” buttons — thank you. Image: Charles Demuth. 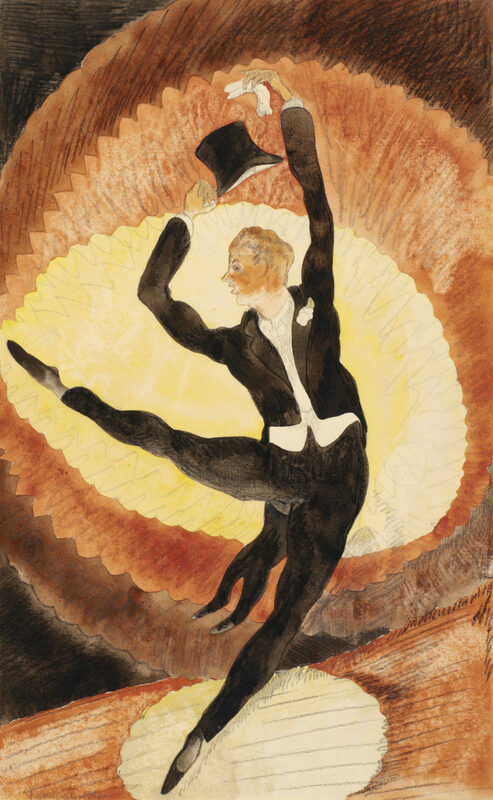 In Vaudeville: Acrobatic Male Dancer with Top Hat, 1920. Watercolor, graphite, and charcoal on wove paper, Overall: 13 x 8 in. (33 x 20.3 cm). BF1199. Public Domain. These great lines pull you in, and you cannot help thinking: Holden really knows something, maybe even the meaning of it all, and yes, wouldn’t it be nice to be like him, to be the catcher in the rye? Perhaps, we already are like Holden, even if we don’t fully realize it. So, what is the iconic quote from “The Catcher” about? A selfless desire to serve others? Man’s selfish refusal to acknowledge his own brokenness? The dangers of human beings positioning themselves as saviors? What does Salinger say to you? Share in the comments. And if you’ve enjoyed the post, do press “like” and “share” buttons — thank you. Image: Pierre-Auguste Renoir. 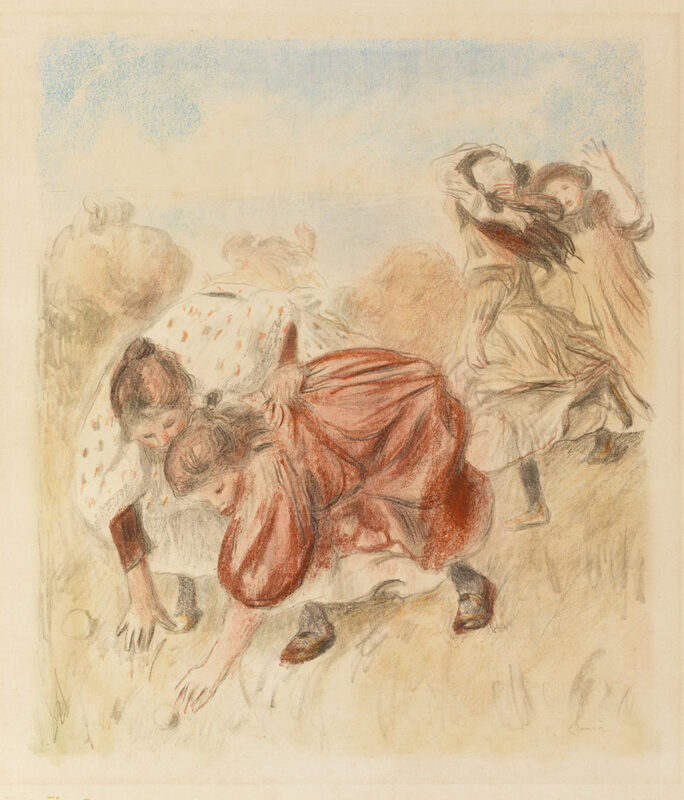 Children Playing Ball (Enfants jouant à la balle), c. 1900. Lithograph in color on laid paper, Overall: 28 7/8 x 24 in. (73.3 x 60.9 cm)Image: 23 5/8 x 20 1/16 in. (60 x 51 cm). BF493. Public Domain. Does “Write What You Want to Read” Equal “Never Get Published”? We’ve heard “Write what you know.” We’ve also heard: “Write what you want to read.” Whichever path you follow, the idea is that it will (may, might) lead you to publication. So, it’s publishing advice. Or is it? Is it worth it to write something “not you” but sellable? You might choose to write “domestic suspense” (or whatever is the go-to category at the moment) for the sake of (some distant day) publishing your “not high-concept enough” novel. But will you have peace along the way? What say you? Share in the comments. If you enjoyed the post, press “like” and “share” buttons — thank you. Image: Pierre-Auguste Renoir. 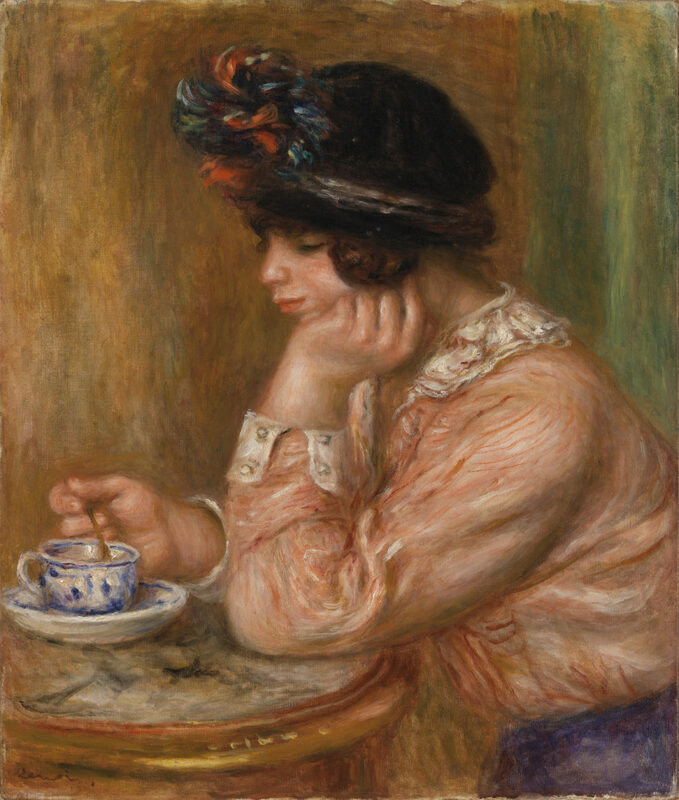 Cup of Chocolate (La Tasse de chocolat), c. 1914. Oil on canvas, Overall: 22 15/16 x 19 7/16 in. (58.3 x 49.4 cm). BF40. Public Domain. It’s fair to assume PG is not Rupi Kaur’s fan. What if he decided to criticize her Instapoetry? He wouldn’t be ostracized because of his poetic preferences, would he?.. “Most often, it seems, when the poet in question is a young woman of color, critics will be particularly intent on proving by a+b why her brand of poetry is blandly generic, consumerist in nature, trite and predictable. This is also often the opportunity for critics to dish out their definitions of what characterizes “good” or “bad” poetry—and those definitions are often shaped by voices from past centuries. Those voices most often happen to be older, if not dead, straight white males, and the critics justify their choice by highlighting the supposed impermanence and universality of their criticism. … Hailing Wordsworth as the end-all in terms of how we must consider poetry implies we’re erasing so much context—political, social, economic, cultural—from the equation. (How could you possibly use Harold Bloom to talk about gender, outside of a narrow, hypermasculine view?) ” — argues A.K. Afferez. She condemns the practice of placing moral labels “good/bad” on texts. By analogy, placing a label “bad” on human beings, and marginalizing them because of their sexuality, race, and gender—straight, white males—seems “at best misguided”, doesn’t it? Do you question “the profound instability, the slipperiness of any (italics mine) written text”? Do you always feel free to voice your opinion? “I had a really good father, and two really good grandfathers, and three really good brothers—far more men in my life than women, in fact. Probably that’s why I don’t think of male characters as being all that foreign to me. The biggest stretch I’ve had to make is reminding myself that men need to shave in the morning.” — Anne Tyler. Planning to pay a submission fee and enter yet another poetry book contest? Read this eye-opener-article by Anis Shivani first. And in case you want a different perspective, revisit this Writer’s Digest article on why writing contests are good for you. So, how do you feel about contests? Share in the comments. In case you feel like entering a free poetry contest, try the rhupunt challenge for a chance to get published in Writer’s Digest. If you like this post, press the “like” and “share” buttons — thank you. Image credit: Paul Cézanne. 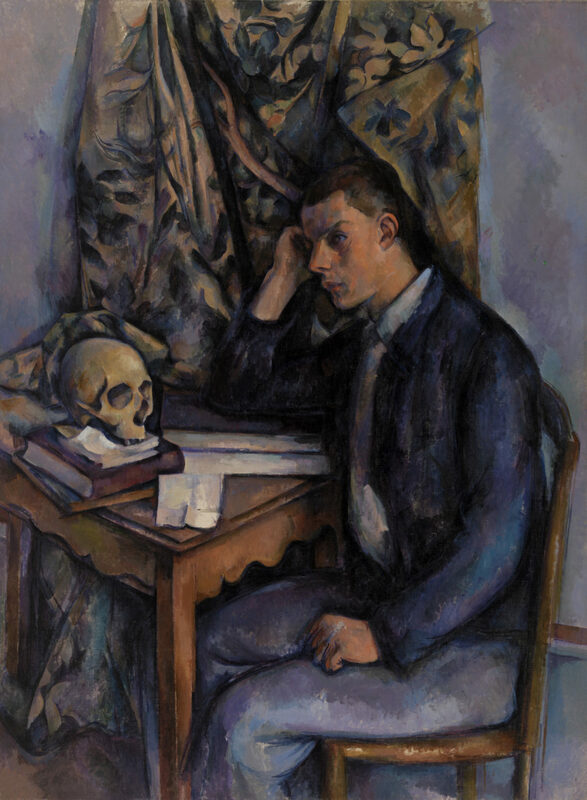 Young Man and Skull (Jeune homme à la tête de mort), 1896–1898. Oil on canvas, Overall: 51 3/16 x 38 3/8 in. (130 x 97.5 cm). BF929. Public Domain. Anne Tyler writes in longhand, then revises in sections in “quite small and distinct handwriting – it is almost like knitting a novel”. When the “knitting” is done, she types up the manuscript, then writes it out in longhand — again. The whole thing. “A blank computer screen makes me want to throw up,” says Niven Govinden. “It’s not conducive to good writing.” Or is it? What do you think? Are you drawn to the old-fashioned? Do you write longhand? Do you find the soft glow of a computer screen exciting and inspiring? Share in the comments. If you’ve enjoyed the post, do press those “like” and “share” buttons. Thank you. 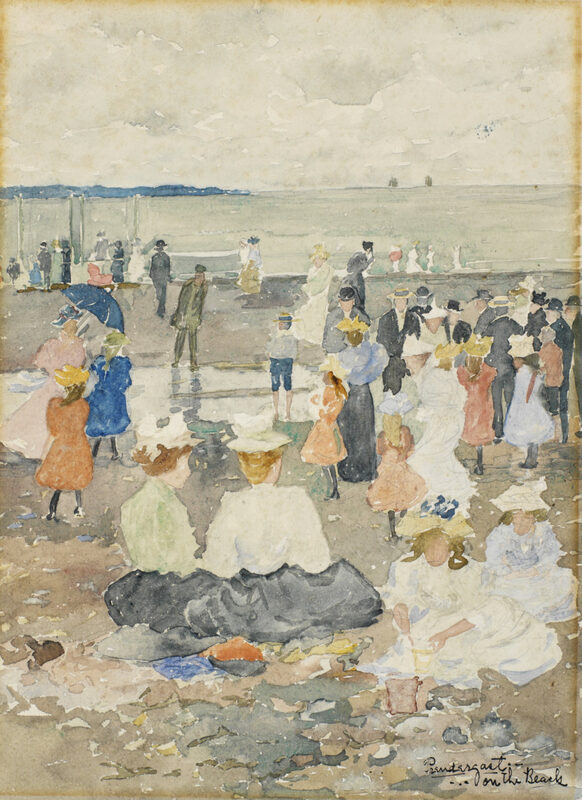 Image credit: Maurice Brazil Prendergast. On the Beach, 1896–1897. Watercolor with graphite underdrawing on wove paper, Overall: 13 3/4 x 10 in. (34.9 x 25.4 cm). BF695. Public Domain. Rachel Mennies refuses “to make a capitalist argument for poetry on behalf of poet, press, or journal.” Although acknowledging the reasons behind poetry submission fees, she’s not a fan of pay-to-play markets. What’s your take on submission fees? Do you keep track of what you spend on submissions? 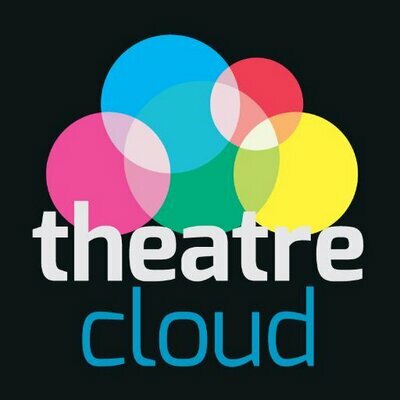 Are you planning to pay-to-play in 2018? Share in the comments. In case you’re leaning toward fee-free options, Erica Verrillo regularly posts lists of free contests, as well as lists of paying markets, for all genres. 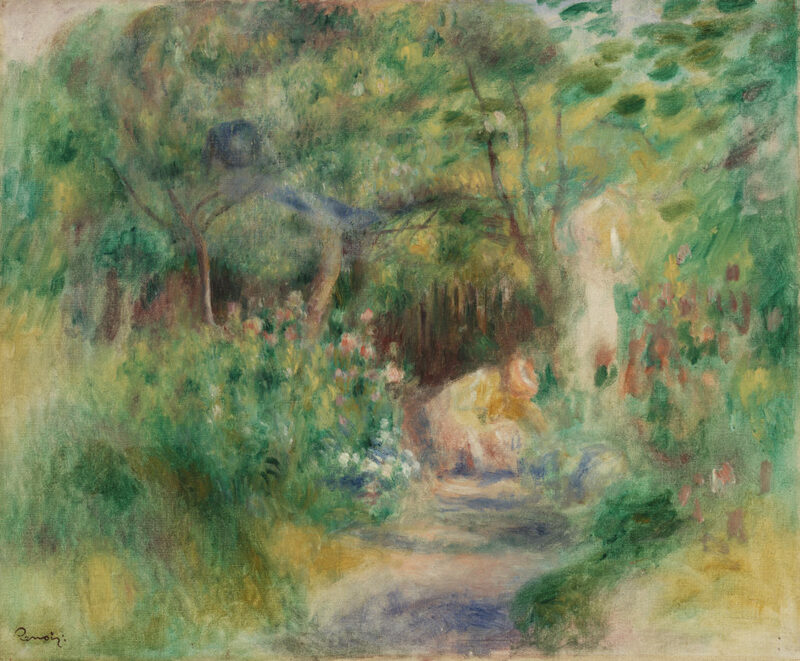 Image credit: Pierre-Auguste Renoir. 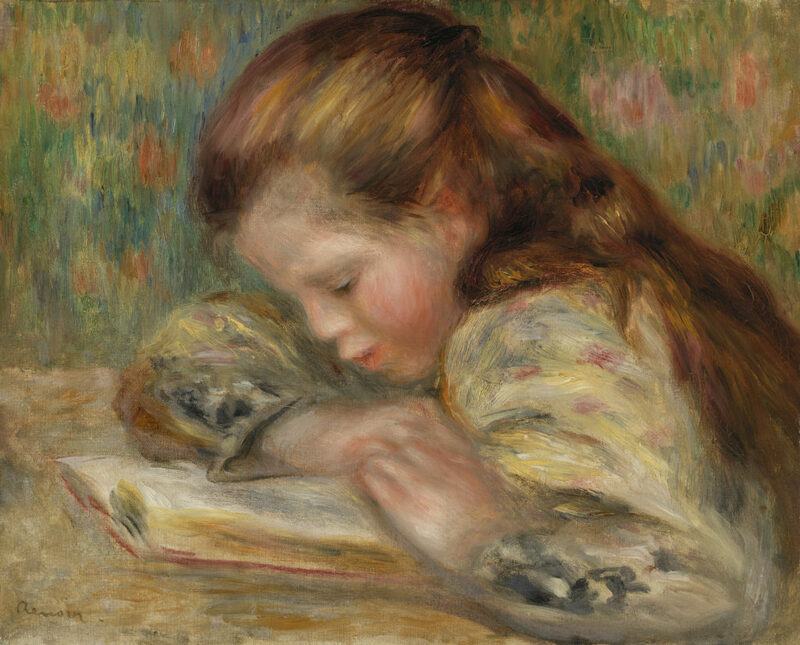 Child Reading (Enfant lisant), early 1890s. Oil on canvas, Overall: 12 13/16 x 16 1/4 in. (32.6 x 41.3 cm). BF51. Public Domain. I write poetry, articles, literary translations, and to-do lists. The Happy Amateur (THA) I now post here every Thursday.